Serving Oklahoma for over 30 years! House Doctors Foundation Repair is a locally Oklahoma-owned foundation repair Oklahoma business and has been serving Oklahoman’s for over 30 years. We are locally owned and operated, a family-owned business passing through the third generation of family ownership. We are a full-service foundation repair company, specializing in residential, commercial and industrial foundation repair services. Owner Ray Alexander has a rich history of working in the foundation repair business, growing up working with his dad in the 1940’s repairing foundations. He later started his own foundation repair business in 1985. He is a pioneer in the foundation business, designing and engineering his own ‘steel pier system’, which is an innovative design that provides one of the most solid foundation systems on the market today. Our personal commitment is to deliver the best customer experience in the industry, through consistently providing the best products, services and technologies. We are committed to working with residential, commercial and industrial customers, building strong relationships to ensure that you are 100% satisfied with our product and services, not only at the time of your repair but for years to come. We work to keep our costs down for foundation repair Oklahoma, so we can keep your costs down. We are not a big franchise company with celebrity paid endorsements; we believe if your company is really solid then you don’t need a celebrity to sell it to consumers. Rather than investing in high paid advertisements, we invest our money directly back into our company, improving our technologies, equipment and our employees. We are committed to ensuring safety, responsibly working with team members with safety practices and guidelines. We are insured as a professional contractor in the State of Oklahoma. As a professional foundation repair specialist, House Doctors Foundation Repair meets all standards for the safety of our workers. We take pride in not only protecting your property but also ensuring that we use environmentally-friendly products that are safe for you and your family. Industrial Foundation Repair – House Doctors Foundation Repair offers professional solutions for industrial customers, including concrete slab lifting, soil stabilization and void filling. Our innovative techniques allow us to provide a variety of solutions to problems that are specific to industrial structures, with the ability to use our years of experience in the industry to provide you with the most cost-effective solution. Our team of repair specialists can investigate unique problems, and provide long-lasting solutions. House Doctors Foundation Repair services the entire State of Oklahoma. We understand the local soils and foundation types throughout the region. Whether you are in the Oklahoma City metro area, such as Norman, Edmond, Yukon, Moore, Midwest City, or Del City, or if you are outside of the OKC metro area, such as Tulsa, Lawton or Ardmore, we are here to help you with your foundation repair problems. We have provided professional foundation repair to hundreds of residential and commercial customers throughout Oklahoma since 1985. Our mission is to provide the highest quality foundation repair services for the best value to our customers. 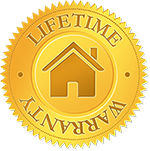 Lifetime Guarantee – Our goal is to ensure that once your foundation is repaired, you will have a solid foundation that will last a lifetime. We stand behind all of our work with our ‘Lifetime Guarantee’, which is also transferrable to future owners for the life of the structure.